* Dance the night away in Mariell's Cubic Zirconia dangle earrings 1 3/4" h x 3/8" w.
* These sparkling lightweight earrings blend beauty with comfort and value! * This delicate wedding or prom jewelry is plated in Genuine Silver Rhodium for lasting shine! 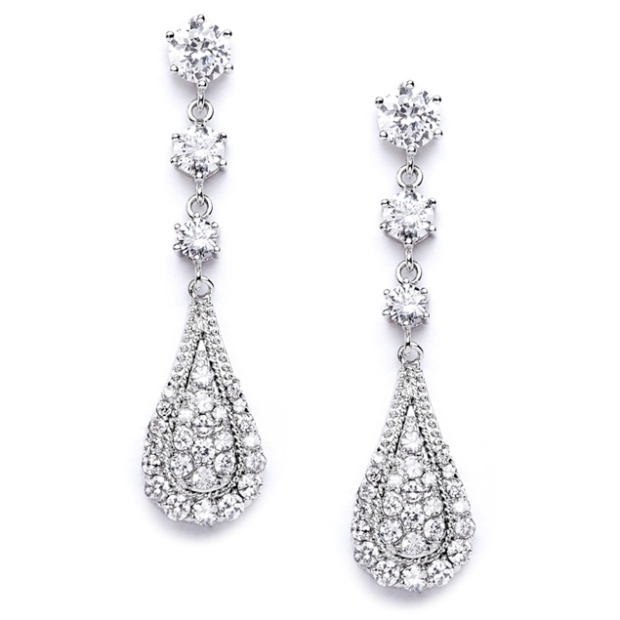 * Add these slender Cubic Zirconia Dangle Earrings to your store's wholesale bridal and prom jewelry collection today. * The modern style and attractive wholesale price make these shimmering CZ dangles perfect for bridesmaids gifts. * Our "no-tarnish" Silver Rhodium plated pierced earrings are a great choice for any retailer or stockist's jewellery case.